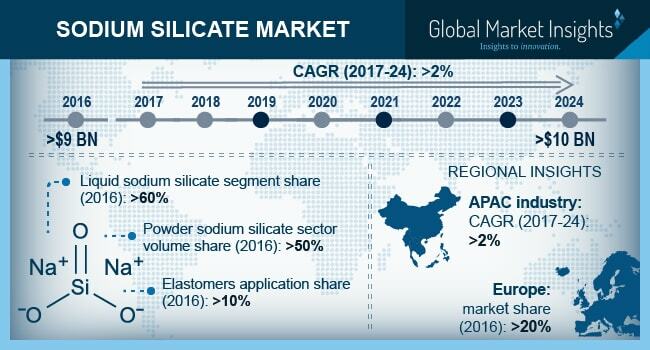 Sodium Silicate Market size is forecast to exceed USD 10 billion by 2024; according to a new research report by Global Market Insights. Sodium silicate is an acid salt which is a combination of sodium, oxygen, and silicon. It has a range of applications including food & healthcare, pulp & paper, elastomers, drilling fluids, coating, textiles, silica gels, pottery, paints, foundry, wood processing, and refractories. Sodium silicate market is majorly driven by rising consciousness among consumer regarding basic hygiene and sanitation amenities which is positively inducing the detergent market. Sodium silicate is one of the building agent used for manufacturing detergent. In addition, its excellent properties offer balanced pH level and crispiness to detergent beds increasing the overall effectiveness of detergents. Rise in global demand for detergents products is augmenting the sodium silicate market over the forecast period. Infrastructure and construction activities are growing at a faster pace in the developing economies. Growing building & construction activities worldwide will enhance the product demand owing its usage for porosity reduction in concrete. Sodium silicate has an extensive application as a catalyst, and it is gaining a significant market revenue owing to consumption in petrochemical refineries. Increasing oil rigs in the U.S. reassures high exploration activities and accelerate huge investments in the oil & gas industry, which will accelerate market growth over the coming years. The application of water glass in catalyst cracking and transesterification operations for producing biodiesel is intensely increasing to meet the growing fuel demand, which will noticeably influence global sodium silicate market revenue till 2024. Market growth is restrained by harmful effect allied on excessive consumption of sodium silicate. Human intake of sodium silicate can cause irritation and inhalation related ailments. In addition, it may also cause lungs damage on injection and inhalation of high concentrate sodium silicate. Further, presence of substitutes products and variation in oil prices will negatively impact the water glass market demand over forecast period. By application, global market is primarily driven by the application of water glass in detergents. This segment will significantly grow, due to rise in consumer awareness regarding personal hygiene. Elastomers accounted for over 10% of the global market share in 2016. This growth is augmented by constant product consumption in automobiles, due to growing demand for green tires. Asia Pacific would grow over a CAGR of more than 2% during the entire timeframe. China’s detergent segment accounts for a share of over 60% of Asia Pacific sodium silicate market. Growing construction, automotive production and oil drilling operations will positively influence product demand in the forecast period. Europe market is majorly driven by paper & pulp and healthcare industry. Recycling operations of waste paper are growing substantially due to rising environment awareness which will further enhance the market by 2024. The global manufactures in the sodium silicate market are Huber, PPG Industries, PQ Corporation, Nippon Chemical, BASF, W.R Grace, Evonik Industries, Oriental Silicas, etc. Market players are investing on research & development to improve their product portfolio and toughen their positions in the market.